The MHF launched its Lives Too Short report at the autumn reception of the All Party Parliamentary Group on Men's Health, bringing together MPs and peers with health professionals and voluntary groups interested in men's health. The report collates the facts and figures showing how male health is poor across a whole range of measures. In the chair was Lord Patel of Bradford, far left in photo, who introduced the guest speakers. 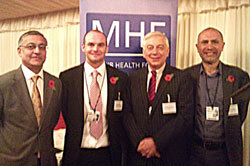 MHF CEO Peter Baker, far right in photo, told group members and guests that the Forum's State of Men's Health poster, launched as part of the Lives Too Short campaign, was the first time for a few years that statistics on men's health across a range of conditions and lifestyles had been brought together and that they paint a terrible picture. Despite improvements in the average life expectancy at birth, different groups of men still experience much shorter lives. Suicide and circulatory conditions continue to take a terrible toll. He urged the audience to sign up to the Lives Too Short Pledge and to display the State of Men's Health poster in their offices. Matthew Atherton, second left in photo, the Community Health Services communications manager for NHS Halton and St Helens, spoke about the poor health suffered by men in the area. The Community Health Services team launched a programme that aimed to understand men's approach to health and then targeted information and specifically designed services at them. The final speaker was the chief executive of the Royal Society for Public Health, Professor Richard Parish, second right in photo. He said that the State of Men's Health poster highlighted the challenges still faced by those trying to improve men's health and tackle public health issues in general. He discussed the possible themes of the government's public health white paper expected at the end of November and how the public health environment might change. Vice-chair of the group, Paul Uppal MP, said that there are good examples of organsiations coming together to tackle men's health and that they could be spread. He mentioned the diabetes work done by the Wolves Community Trust with the local NHS and supported by the premier league and the Professional Footballers Association. Lord Patel of Bradford closed the event by asking parliamentarians and guests to support future work of the group and in the meantime to back the MHF's Lives Too Short campaign.